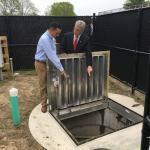 Lake Ronkonkoma's New Wastewater Treatment System - P.W. Grosser Consulting, Inc.
Lake Ronkonkoma is Suffolk County’s largest freshwater lake, and once drew thousands of visitors every year. 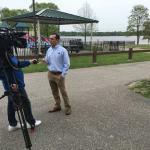 But in recent decades the lake has become a symbol of environmental neglect due to its high levels of bacteria, algal blooms, and nitrogen pollution. PWGC was commissioned to engineer a new I/A (innovative/alternative) on-site wastewater treatment system that will remove over 200 pounds of nitrogen every year (taking levels below 19 mg/L). Our new design replaces an older sewage system consisting of a septic tank and fourteen leaching pools. Future contamination will also be reduced with the addition of a shallow drain field that recharges the treated effluent in the upper soil layers—these layers are more biologically active than the deeper soil layers found at the bottom of conventional leaching pools. 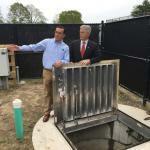 The new treatment system is being launched as part of Suffolk County’s Reclaim Our Water revitalization initiative, which aims to reduce nitrogen pollution and reclaim water quality by improving wastewater treatment technology. 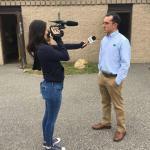 The new treatment system is now operational, and was commemorated with a press conference and ceremonial “first flush” with County Executive Steve Bellone along with other local officials, community leaders and environmental advocates. Bryan Grogan, PE, Senior Project Manager explains the new system to journalists and County Executive Bellone at the unveiling of the new treatment system.